Some little seasonal elves visited me today! We're starting to get in the spirit around here! And, as we do every December 1st, we pulled down our vast collection of Christmas books so I'm happily perusing all the old favorites. Of course they are all kids books...well except Dickens ...because I just can't resist a great kid's book! 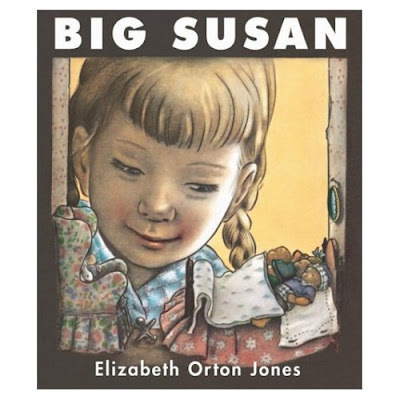 ( Actually I have a hard time resisting books in general) I had to start with Big Susan by Elizabeth Orton Jones which, since its main characters are dollhouse dolls, is at the top of my list. This is such a sweet story about love and the power of imagination and if you have children... or are just a big doll lover like me... I highly recommend it. I promise to share some of my other favorites in the days to come, but in the meantime I'd love to know, what are your favorite Holiday/Christmas books? I can't really think of a favorite Christmas book, but what comes to mind is the Christmases in the Little House series of books (Laura Ingalls Wilder)...I really loved those Christmas chapters! I like those little elves. very cute! Those elves are so sweet!.. My favourite Christmas book as a child was 'Pookie believes in Santa Claus' - about a believing rabbit. I'd love to find it again. Your post made me think of it. "A Christmas Story" by Mary Chalmers. My favorite since childhood. Soooo sweet. oh my those elves you made- stripes get me everytime! So many winter reads I love! I think I better stop there for now- I could go on and on! Oh "The Tomten" and "Ride on the red Mare" are a couple of our favs too! 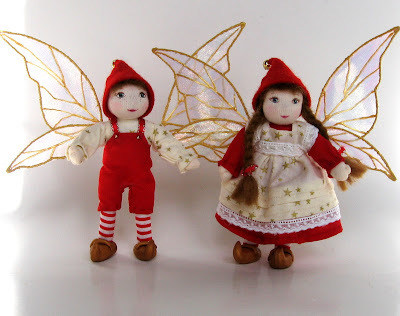 Your new elves are very sweet Cynthia! Two of my favorite Christmas books are by Tasha Tudor: "Becky's Christmas" and "The Doll's Christmas." Your dolls are amazing and I will have to look up this "Big Susan" book. I can tell I would love it. My children always get out 'The Night Before Christmas', but I have to say I have really gone off it now!